The PAC200 is a power relay battery isolator in a weatherproof package. 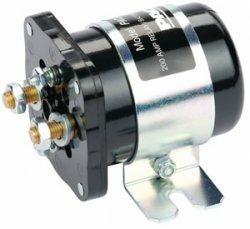 Designed for the isolation of an auxiliary battery or delivering a large amount of power to auxiliary loads such as light bars, DC powered electric heaters and more. Installation is simple and can usually be carried out in a single afternoon. Just wanted to say.... WOW! Received in a little over 48 hours. Lowest price+ship (by 10 bucks). Zzzzoom shipping. This was first purchase with 12volt-Travel. You have a new soon-to-be returning customer. Customer Service and Sales 1-888-412-8058 Call Monday-Saturday 9AM-6PM est.